The highly accurate and fast analog mass flow meter SFM3100 exhibits a compact design that allows for its easy integration into existing devices. With a temperature sensor located in the gas channel of the flow meter, the SFM3100 is capable of achieving a highly precise temperature compensation while simultaneously eliminating the need for a dedicated temperature sensor. Furthermore, the SFM3100 is capable of measuring flow ranges between -24 and +240 slm, detecting negative flow ranges as well as recognizing errors or impeded flows in a highly reliable manner. In addition, this precise flow meter is also capable of compensating multiple gases simultaneously, all the while maintaining an excellent precision rate in the process. All flow rates and signal characteristics of the SFM3100 can be customized to meet specific requirements as requested by the consumer. 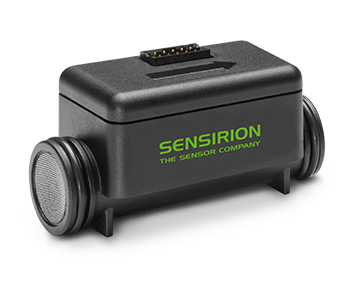 Like all Sensirion sensors, the analog mass flow sensor is based on the patented CMOSens® Technology that combines both sensor and analysis electronics onto a single microchip. By utilizing this technology, Sensirion’s SFM3100 achieves a highly stable and precise capability that can be easily applied for both demanding and cost-sensitive applications. The SFM3100 is particularly suitable for applications that involve inspiration techniques, as well as those that require oxygen and air to be mixed to a very precise degree.